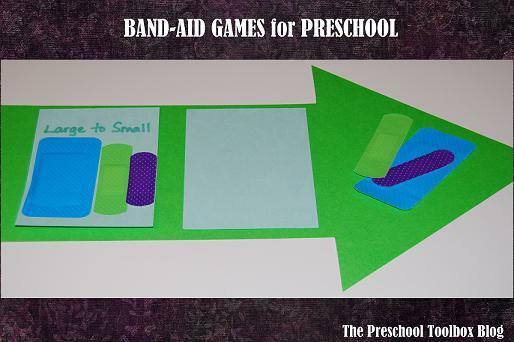 COMMUNITY HELPER THEME FOR PRESCHOOL- Band-Aid Games for a Doctor or Nurse Center in Preschool! This week’s #playfulpreschool activities are centered around COMMUNITY HELPERS! We hope your own children enjoy learning about all the different people who serve our communities through the jobs they do. Doctors and nurses are important community helpers! 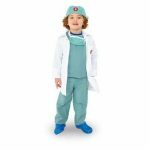 Most preschoolers have visited a doctor or a nurse and will have some information about the duties they perform. Doctors and nurses work as a team to help keep members of our families, neighborhoods, and community healthy! 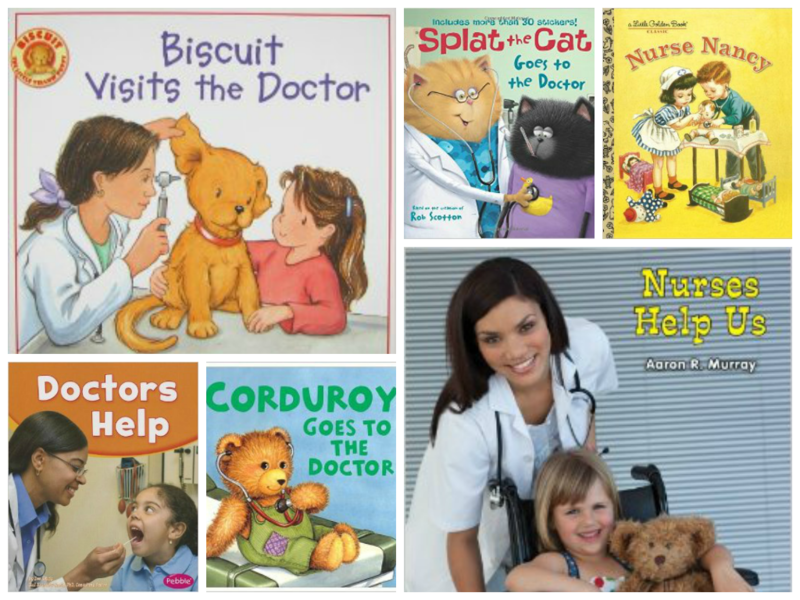 Some children may be afraid of going to the doctor (mostly due to immunizations), but reading good books and having conversations about what doctors and nurses do will help! Band-Aids – aren’t they just amazing?! Doctors and nurses use bandages to cover and protect many “ouchies” that children have. Preschoolers are fascinated by BAND-AIDS. The more colorful they are, the better they seem to work (even if the “ouchie” is imaginary). We captured a little of the “band-aid love” in our own classroom when developing our doctor and nurse community helper extension games. Materials Needed: Band-Aids (have parents donate a box for the classroom or many dollar stores sell band-aids in assorted colors/sizes/patterns) and Index Cards. Invite the children to sort and order the band-aids into small, medium, and large sizes. For younger children: order the band-aids on a blank index card from small to large (or large to small). The children can then sort/order onto a separate card (see photo above). Invite the children to sort the band-aids to find matching pairs of different patterns, colors, characters, or sizes. 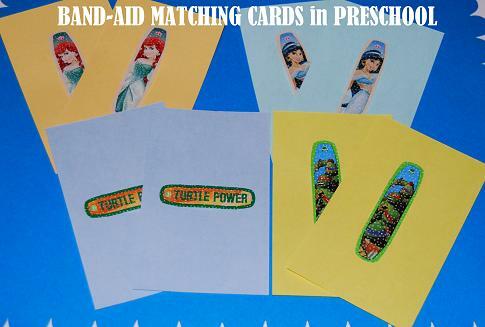 The children can then peel and stick the matching band-aids to separate index cards to play various matching games. Go on a scavenger hunt around the classroom or at home. Hide ONE card (of the matching pair) in different locations. Give the children a card and have them locate the match. Place all the pairs face down in rows on a table or the floor. The kids can play the matching game (memory style) by turning over two cards at a time to see if they form a match. If the cards do not match, the cards are turned face down and play continues to another player. The game is over when all the band-aid pairs have been found! For the classroom (or a homeschool party) – make several matching sets of cards. Give each child a card and have them locate a peer that has the matching size, pattern, color, or character band-aid card. Set out an assortment of band-aids on a table. Invite the children to use the different colors, patterns, sizes, or characters to form basic patterns! In the photo above, one student used Ninja Turtles, green, and Hello Kitty band-aids to create an ABC pattern. Younger children can use fewer band-aids to create basic patterns (AB, ABC, AABB, etc.) and older children can use a larger variety to create more complex patterns (ABCD, AABBCC, ABBC, etc.) The band-aids do not have to be peeled for patterning, but it’s great fine motor work if there are enough to play with. Invite the children to peel and stick one character band-aid on an index card. The children will most likely know the name of the character, but not the LETTER that the character’s name begins with. Ask the children to say the name of the character and then write (or alphabet stamp) the corresponding beginning letter on the index card. 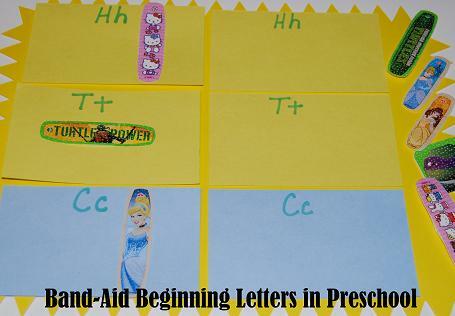 As the children practice and gain confidence, set out cards labeled with just the beginning letter and invite the children to locate the band-aid whose character name corresponds to that letter. 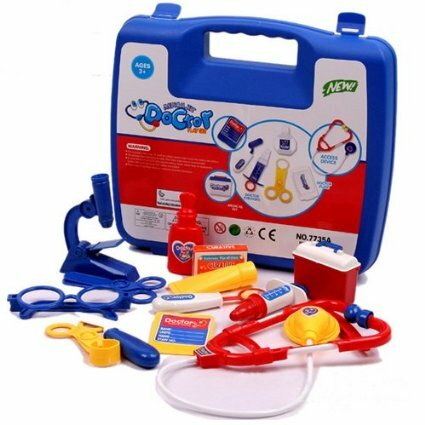 Medical Kit for role play with all the necessities (except band-aids)! Full uniform for role play as a doctor or nurse! Join us tonight at 9:00 EST for a Live Google Hangout. We will be sharing fun crafts, learning activities, and movement games for the community helper theme.The event will be recorded and available for viewing afterwards. « Dinosaur Theme for Preschool: Hatching DINO Eggs – Early Math & Science. Yes! we love band-aids. I love the book Corduroy goes to the doctor! We’ve recently read that book. What a wealth of great learning ideas with bandaids! How smart! My son loves band-aids and this would definitely be a hit with him. 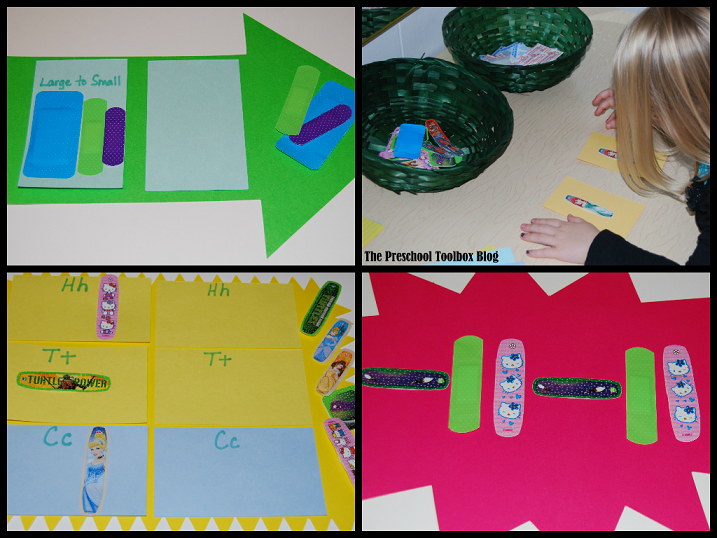 My kids LOVE bandaids – what a great idea to turn it into a literacy lesson. I love the patterning activity with Band-Aids and that you have the children create their own patterns. We will have to try this. That is a great book list too! Band-aids are such a hit in my class, too! I absolutely adore the activities you’ve shared here. I can’t wait to try them out sooooooon! Mary – have the parents donate a box as we went through several boxes, but it was FUN. The kids asked to do it again this week, but we used all the band-aids except for the first aid kit. :) Thanks for your comment! What a great idea to take something that kids already love and use it for learning opportunities! Jodie – thanks for your comment! It was fun and, of course, the kids had a blast!